This was not the ending either of them expected. 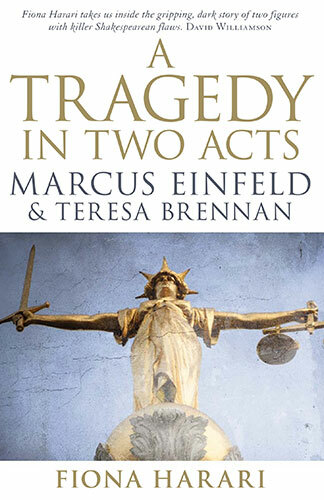 Marcus Einfeld, former Federal Court judge and human rights champion, and his old friend Teresa Brennan, an exuberant, sometimes controversial US-based academic, had each spent years establishing demanding careers and international reputations, to create two lives that, on paper at least, exuded success. Then Einfeld was caught speeding. But rather than pay a small fine, the former judge told a court that Brennan had been driving his car. In reality she had been dead for three years. Through a chain of events that at times seemed exceedingly unlikely, Einfeld’s lie was exposed, with once unimaginable consequences. His world, and virtually every honour he had earned, rapidly disappeared. And his old friend Brennan, who had died in suspicious circumstances, was suddenly, posthumously, attracting attention for all the wrong reasons. This is the remarkable story of two outstanding Australians whose lives have been lived large, and who, ultimately, have been bound by tragedy. In 2006, former Federal Court judge and human rights champion, Marcus Einfeld, claimed that he was not at the wheel of his car when it was booked for speeding. Instead, he stated in a statutory declaration, his friend, Professor Teresa Brennan, had been driving. Unfortunately, at the time of the offence, Professsor Brennan had been dead for three years. Fiona Harari has taken this seemingly inexplicable event and used it to look back on the lives of each of these two brilliant, but flawed, Australians. Act One of the prologue takes us to Deerfield Beach, Florida in 2002 where Teresa Brennan is the victim of a car accident which will lead to her death. Why did this 50-year-old, healthy, attractive woman walk out into a storm at 2.00 am, leaving her apartment door open, and not dressed for the weather? Was she the victim of an unknown hit-run driver or was it something more sinister? Act Two sees the jail door close on Marcus Einfeld in 2009. His title of Queen’s Counsel has been stripped from him as has his Order of Australia and he is no longer eligible to practice law. He has been pilloried and humiliated in the press and even those who didn’t know of him before 2006, now know him as the judge who lied to cover up a minor misdemeanour. How did he come to this? Einfeld met Brennan in the late 1970s and remained friends in the intervening years. Perhaps they even had a more intimate relationship. Over the years Brennan told friends that they did and others that it never happened. It hardly matters as either scenario cannot explain Einfeld’s actions as he was made aware of her death when it happened. This is an interesting, well-written, book which follows the course of Einfeld’s rise to become a ‘National Living Treasure’ to his imprisonment and attempts to explain how this may have happened. It also introduces us to a fascinating woman, fiercely independent, who was known by her contemporaries for her scholarship, her innovative teaching and her originality, as well as the highs and lows of her temperament. Her story is, to this reviewer, the more interesting of the two. A quick Google search brings up her name only in context with the unedifying actions of Einfeld and that is a shame.